Tobacco companies have been issuing insert cards since the 1870s and collecting cigarette cards became a popular hobby at the time and for some remains so today. Cards were originally used as “stiffeners” in packs, helping to protect the cigarettes. Very soon they were recognised as a potential vehicle for advertising and promotion, both of the cigarettes themselves and other products. In 1933 WD & HO Wills, one of the founding companies of the Imperial Tobacco Company, took this idea a huge step further and devised a special promotion using miniature playing cards as the means by which collectors could exchange completed miniature card packs for other desirable card playing items. 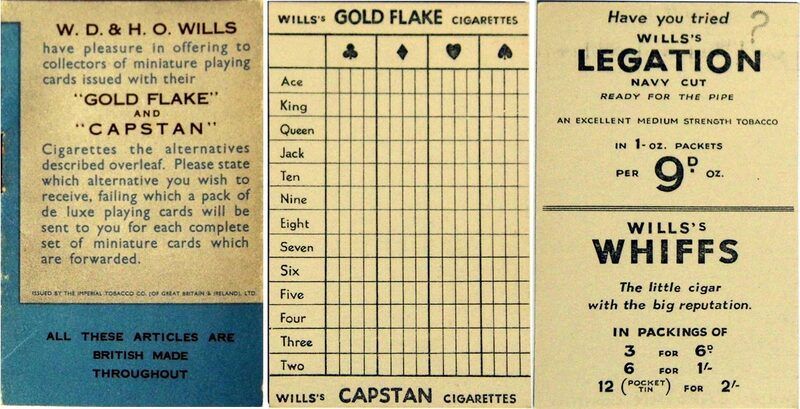 Each pack of ten Gold Flake and Capstan contained 2 miniature playing cards. Collectors were encouraged to assemble complete packs of cards, each about one quarter the size of “normal” cards, which could be exchanged for full-sized playing card sets or related items. There were minor variations to faces and backs and the last ones had the closing date overprinted – 28 February 1934. I have been tracking down materials from this promotion, and these are presented below. I am still not sure how the original promotion was launched, but it is clear that a large number of small booklets and other collecting materials, along with the miniature playing cards, were included in the relevant cigarette packs. These comprised: (1) an eight-page stapled booklet containing details of the seven special card offers which were available to collectors; and (2) one or more “collection cards” by which collectors could monitor their miniature playing cards as they were acquired. All the promotional inserts were 2¼ x 3½ inches, although the collectable cards themselves were much smaller at 1¾ x 1¼ inches, and thus only slightly larger than ¼ of a full size playing card. Above: backs of miniature playing cards inserted into packets of ten Gold Flake, Star and Capstan cigarettes, 1930s. The right-hand card has the closing date overprinted – 28 February 1934. Above: the faces of the miniature cards. It is perhaps worth noting in passing that if two miniature cards were included in each pack of 10 cigarettes, and assuming the unlikely proposition that the collector had no duplicates, he/she would have to buy (if not smoke) a minimum of 260 cigarettes to collect one single pack of miniature cards! And each pack of miniature cards was exchangeable within a year of the scheme starting. To collect the eight full packs required for the most “expensive” gift (see below), a minimum of 2080 full strength, untipped ciggies would have to have been consumed within the 12 month period! It is anybody’s guess as to how many cigarettes would have to be purchased in practice to assemble one or more complete packs, but considerably more than the minimum number described. Above: 1) the front of the 8-page booklet explained the scheme whereby packs of de-luxe playing cards could be had in return for complete sets of miniature cards. 2) a “collection card” helped collectors to monitor their acquisitions and identify gaps in their collection. 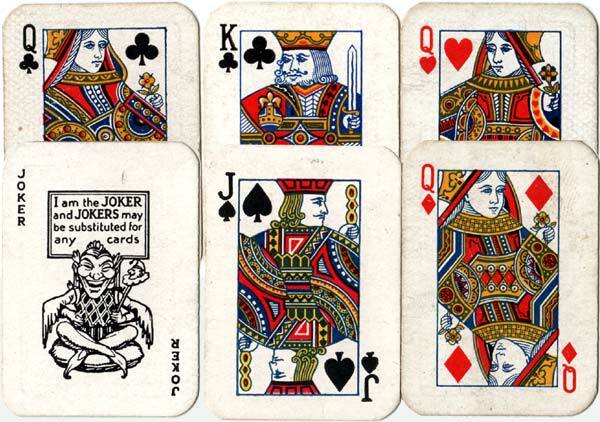 Jokers were amongst the miniature cards distributed and could be used to replace any other of the 52 cards required. 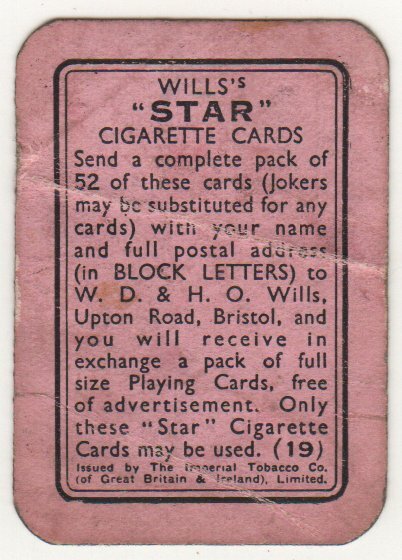 3) the back of the collection card was used to advertise other WD & HO Wills tobacco products. As explained in the booklet, it was possible to exchange one miniature pack for either a 160 page hard-backed book by Lawrence H. Dawson, “Popular Card Games”, published (of course) by WD & HO Wills and printed by Mardon, Son & Hall. Alternatively, one miniature pack was exchangeable for four Bridge score blocks, with pencils, and a specially designed Contract Bridge score calculator in card and metal. Two miniature packs could be exchanged for two packs of “De Luxe” patience cards together with a specially prepared mini-book containing details of a wide variety of patience games. As with all the booklets prepared for this promotion, it is dated 1933. For three miniature packs there was again an alternative choice. The first was a leather wallet containing two packs of cards, together with a bridge scoring block and pencil. The second option was a cardboard case with two packs of Bezique cards (Ace to 7), two scorers and a booklet.